-	KMTronic IP: device IP you set in the previous step. -	KMTronic Port: device HTTP Port if you changed it. 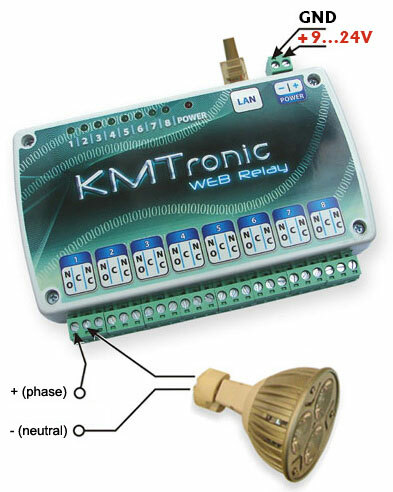 -	KMTronic User & KMTronic Password: the one you use to access to the device from a browser (web interface). -	Polling: Set it to “On” only if you plan to change the state of the relay from the native KMTronic web interface, otherwise it is not necessary. -	Polling seconds: select the frequency you want to update Control4 about the change coming from the KMTronic web interface. -	Dealer e-mail: the email you communicated to obtain the license of the driver. The license is bound to such email. -	Max KMT Relay Devices: maximum number of KMT Relay boards you are connecting to the C4 controller. It is the number we asked during the license buying process and the license is bound to such number. The first license dealers get for free is limited to 2 boards. -	License code: copy & paste here the license code we sent to you during the license buying process. You simply have to create new connections. Have fun with our Homemade Organic Drivers!